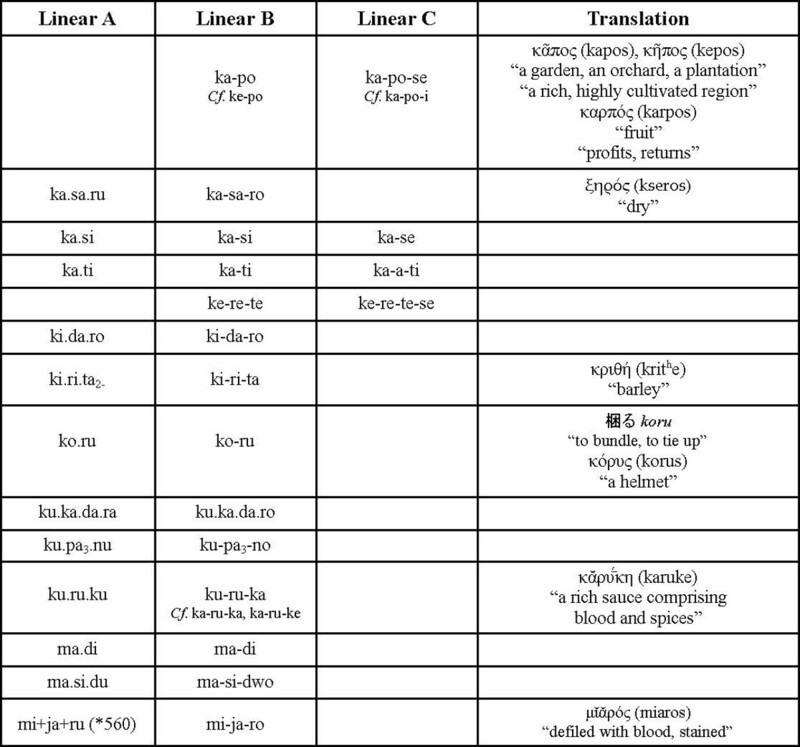 Although Linear A* and Linear B are deemed distinct scripts, their mutual influence is demonstrated through phonetic comparisons (see Younger). 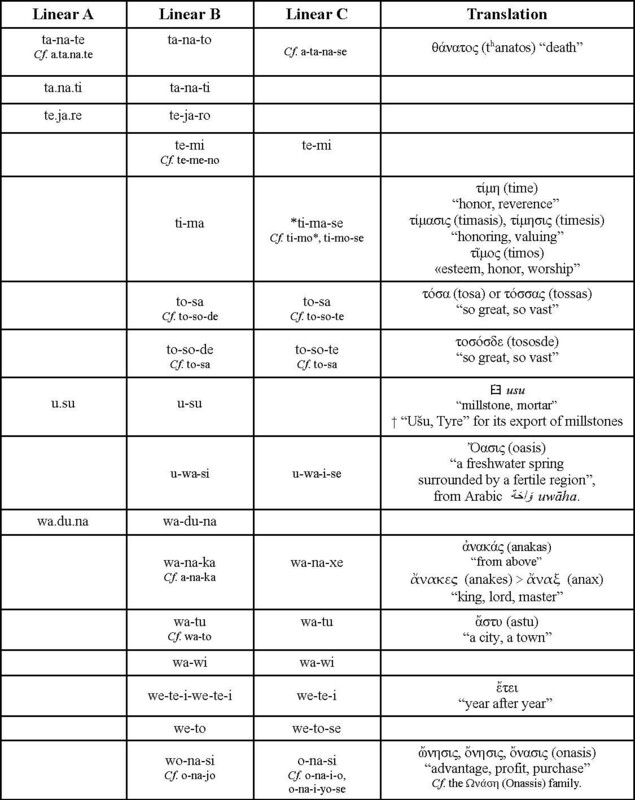 And, although both Linear B and Arcado-Cypriot (Linear C) are deemed Greek scripts, there has been no concerted effort to compare them, perhaps because it is believed that the two Greek scripts represent separate dialects that bear little relationship to one another. I disagree with such an assessment, which, I believe, arises from a limited understanding about the influence among the three scripts. On the contrary, I believe that both Linear B and, to a surprising degree, Linear A provide glimpses into the early, Greek language and that Linear C helps to bridge the gap between the early and the classical periods. For example, in Linear B, we see the emergence of word-final /ν/ and /ς/ in words such as ki-to to ki-to-ne > κιθών (kiton) or χιτών (khiton) “a tunic” and a-ke-re to a-ke-re-se > ἀχαρές (akhares) “pain, sorrow” or “ἀχᾶρης” (akhares) “too short to be cut” or ἀχηρής (akheres) “burdensome, grievous”. 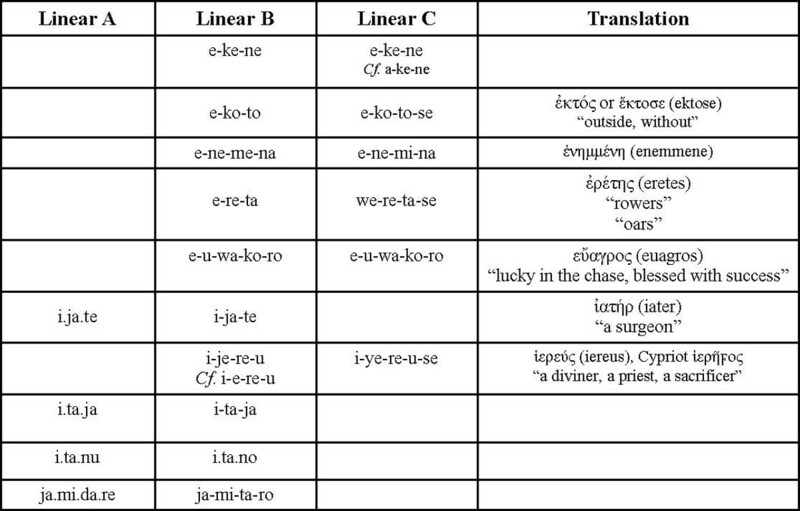 In both Linear B and Linear C, the incidence of word-final /ν/ is roughly the same; however, the incidence of word-final /ς/ grew from 17 words in Linear B to 158 (at current count) in Linear C. Thus, we may witness the development of the language through pairs such as LinB e-ko-to > ἐκτός / LinC e-ko-to-se > ἔκτοσε (ektose) “outside, without” and LinB ke-re-te / LinC ke-re-te-se (meaning uncertain). 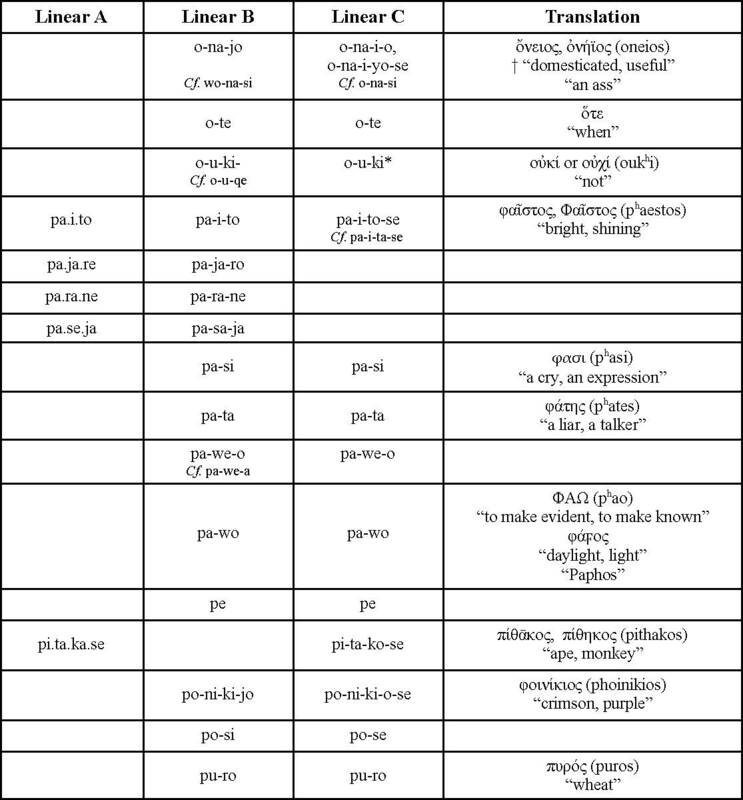 As regards the table of correspondences, the word-final alternation between /u/ in Linear A and /o/ in Linear B becomes apparent in pairs such as a.ti.ru / a.ti.ro and ka.sa.ru / ka-sa-ro. In instances of anomalous word endings, such words may be regarded as borrowed words. For example, LinA ko.ru and LinB ko-ru. may be regarded as Linear A words in both contexts, even though the meaning from one language to the other has changed. In Linear A, 梱る koru may refer to the verb, “to bundle”; in Linear B, however, κόρυς (korus) may refer to “a helmet”, the rounded shape of which may resemble a bundle. Morover, ku.ro, universally attested as “total” in Linear A, may be regarded as the Greek equivalent of 繰る kuru “to count”. In Greek, the /ku/ in ku.ro is transformed into the rough breathing of hro, the Greek letter “Rr”, which resembles a plus sign in both Linear A and Linear B [see KN V 280]. In Linear C, we see the cursive form of the sign, which would eventually be standardized as /Ρ ρ/. The omission of Linear C in the study of the Cretan scripts is an omission of an essential period in the development of the Greek language. There is still much to learn, and a tripartite study of the syllabic scripts provides a critical foundation. 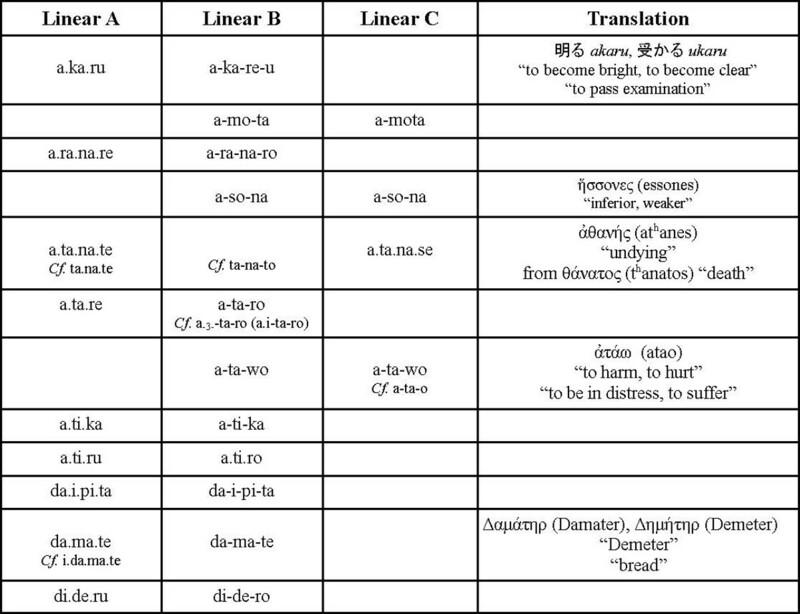 *Note: This article presumes that the underlying language of Linear A is Japanese. Fantastico! I couldn’t more agree. Wonderful work, Gretchen! P.S. 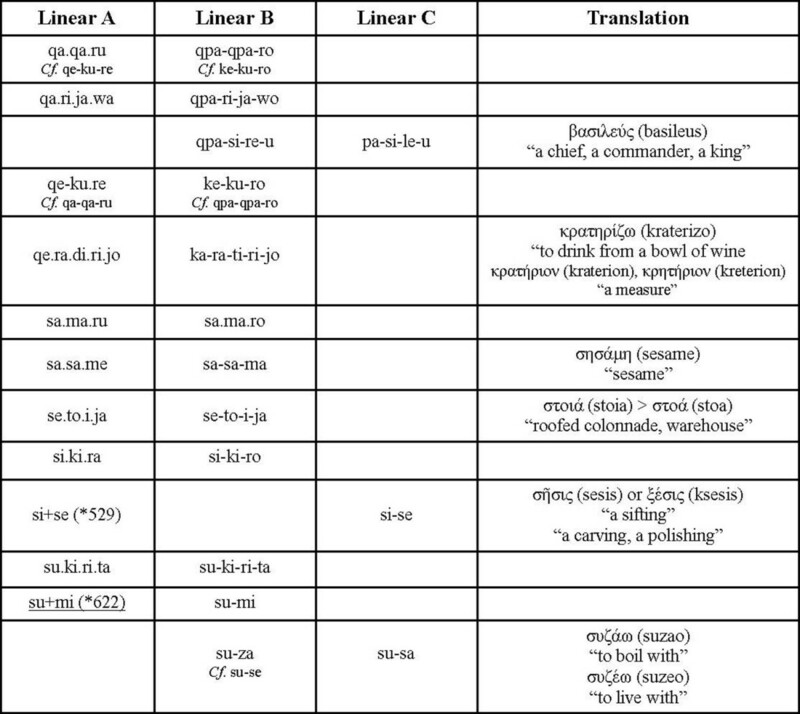 What do you think of Peter van Soesbergen’s hypothesis that Linear A is a Hurrian dialect? He is absolutely convinced he is right, and not even a Mack truck will move him. What do you think? I think he is way off the mark. But who is to say? Thank you, Richard. I have not read Soesenbergen’s work so cannot say; nevertheless, I profess a shameless bias toward the evidence that supports my own hard work. While I may disagree with Soesbergen, Hurrian may yet provide valuable clues in Linear A’s development or influence.